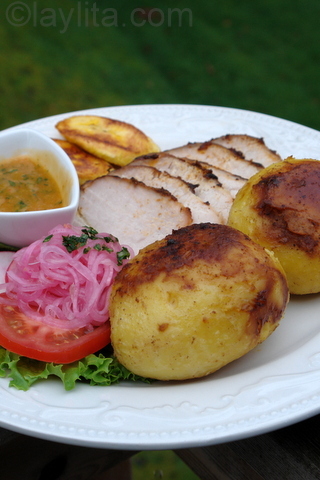 Pernil style roasted pork is a typical dish in Ecuador and many parts of Latin America. The pork is marinated in a sauce of bitter orange juice, onion, garlic, achiote, cloves, cinnamon, cumin and panela and slow roasted in the oven for several hours. The whole process for cooking pernil is close to hornado de chancho, however the marinade and spices are different. Pernil style pork adds clove and cinnamon which give the meat a very special flavor, also while the hornado meat should be very moist, the pernil meat is very dry, but both should be extremely tender. 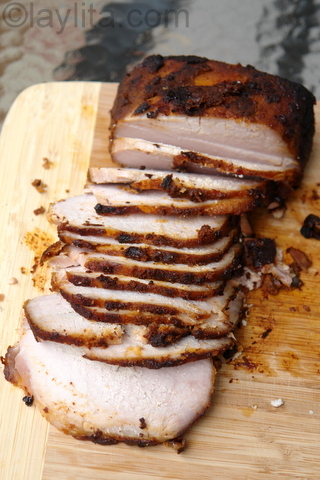 The roasted pork can be served as part of a meal, but many times is used to make sandwiches. Just like with hornado, a pork leg is usually used to make pernil, however a pork loin makes it easier to cut the roasted meat. 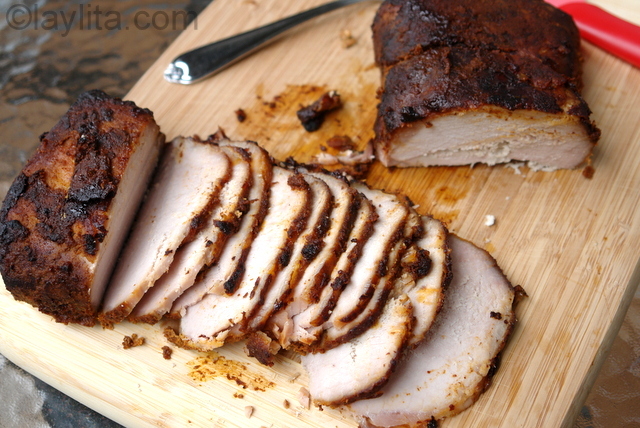 Pork loin is also more readily available and is smaller than a pork leg (7 lbs vs. 20 lbs). Pernil is pork marinated in a sauce of bitter orange juice, onion, garlic, achiote, cloves, cinnamon, cumin and panela and slow roasted in the oven for several hours. Whole potatoes sauteed in butter, pickled onions, fried ripe plantains and tree tomato hot sauce. Blend the onions, garlic and bitter orange juice to obtain a puree. Make several cuts or incisions in the pork loin and add the onion marinade, rub the pork loin with the marinade trying to get it in to the incisions. Let the meat marinate for at least 1 day (2-3 days is ideal), turn it over every 6-8 hours. This is a dry roast and the marinade on the roasting pan can leave stains - to avoid this I recommend lining your pan with foil. Pre-heat the oven to 275 F, bake for 3 hours, turning the roast every hour. Increase the oven temperature to 350F, bake for another 2 ½ hours, turning the roast every 30 minutes. Slice the meat finely and serve with whole potatoes sautéed in butter, fried ripe plantains, tomato slices, lettuce, radishes, pickled onions and tree tomato hot sauce. Another difference between hornado and pernil is that for pernil the skin and as much fat as possible should be removed from the meat, and while the hornado needs to be constantly kept moist by “bathing” it with beer or chicha while roasting. 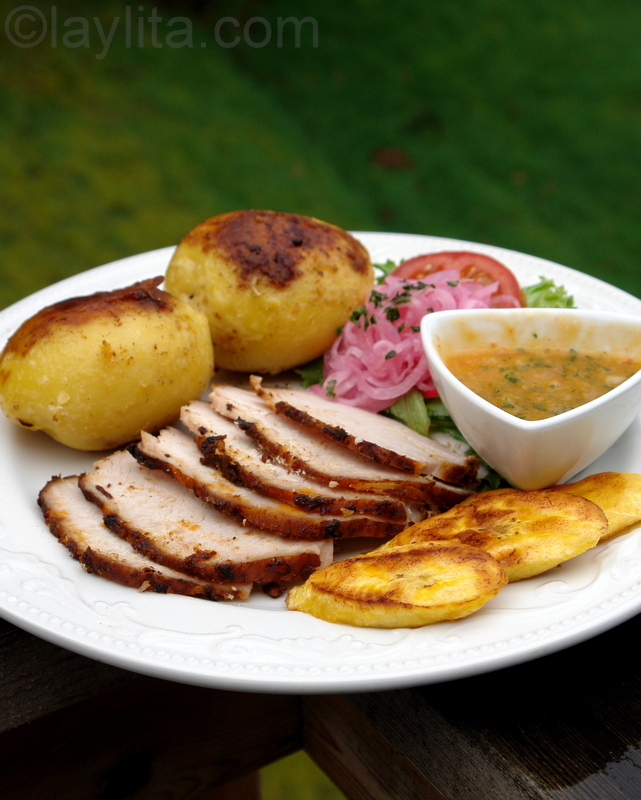 Both roasted pork dishes are delicious with very different flavors and textures. I recommend trying both (well, not making both at the same time) to taste the difference. Also, several Latin American countries have different versions of pernil, which are very different than Ecuadorian pernil. 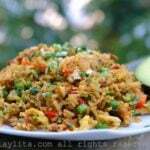 For example, what is known as “pernil” in Puerto Rico is much more similar to Ecuadorian hornado de chancho. Oh my goodness, the marinate is seriously unbelievable. It’s now going to be a hard wait until it’s ready. Thank you! I made this because I wanted to make pernil sandwiches for a “cafecito” with Ecuadorian friends. Everybody loved the pernil sandwiches -I also made the pickled onions. The only problem that I had is that the marinade completely dried during the cooking process so my cooking pan got ruined and I had to put it in the trash afterwards. I will make sure that the marinade doesn’t dry next time. Hi Carmen – Sorry to hear about your cooking pan, you can also line your pan with foil to prevent this from happening. That’s what I was looking for. Today is sunday and I’m cooking it. Thank You. Hi, I am also from Ecuador living in the USA. I was curious about finding a good recipe for Pernil. As a kid, I remember eating a sandwich made out of this delicious meat every once in a while when I would go to the ‘Centro de Quito’ with mom and grandpa. It was a treat I will never forget. I have been fortunate to have married a ‘Great Cook’, as well, that also enjoys making diferent types of dishes from all over the world (France included :) ). My son and I reap the benefits (and sometimes the failures :) ) of these ‘excursions’ but we enjoy every minute of them. I will try to bake the Pernil in my brick oven that I built a couple of years ago and so far cooks pork real tender and in the old rustic fashion…. can’t wait! Thanks a lot for all your work, and keep surprising us with your creations. Thanks so much, I’ll be back for sure!!! looks very delicious…i love to explore the taste of food by using herbs & spices..the plate presentation is good but i guess if it will be base on a standard presentation of ingredients, specially the side dishes it must not go beyond the plate’s border line. When I googled pernil, I never thought I would find something this beautiful. The presentation that you used is simple, but yet enough to enhance the mind about all the delicious flavors that this plate has. Your images make my mind water and turn on my appetite. My God! that roasted pork loin looks good with those roasted potatoes too. To die for! This looks delicious. 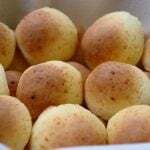 The word “panela” caught my eye on tastespotting. I don’t see that very often, yet I know exactly what it is. I have lived in Peru for 5 years and love the cuisine of latin america. This pork looks delicious and will be bookmarked for a later date. Thanks! But we have discovered the enchanting world of Ecuadorian cuisine through your website! And now you treat us to the recipes for an entire traditional dinner with all the trimmings! I can practically smell that delicious-looking pork roast. This will be my Sunday project. Keep your fingers crossed that my husband’s mental health cooperates, as the man simply adores pork roast when he’s well.